New ereader or tablet incoming? 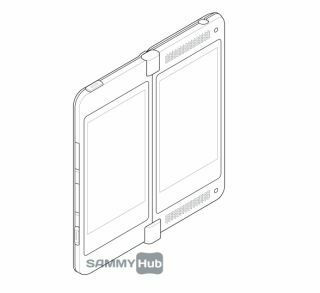 Design images purportedly from Samsung's brain trust have surfaced, indicating that the company may be considering a clamshell design tablet or ereader. The dual-display drawings show a hinged book-style design, with one showing two sizeable screens (presumably these would be touchscreens) and the other showing two smaller facing screens with a QWERTY keypad stretching beneath them. It's not clear exactly what device this would be; it could be a Samsung ereader in a nice book-like format, or perhaps even a clamshell tablet. After all, if Sony can go off the beaten tablet path with its funny cylindrical Sony S2, why not Samsung? It could even be a smartphone or a gaming device, although we're not convinced that either of those would be a good idea. Hey, we're just spit-balling here; the likelihood is that it's none of the above, merely some prototype style drawings knocked up by a work experience kid. Either way, it's fun to speculate so if you have any better ideas for what Samsung could be trying out, let us know in the comments below.